This is the current state of my room. Messy piles. Water bottle half full. When I turn on the fan, a quilt block detaches from the design wall and floats to the floor. Where it may or may not stay for days. I’m getting tired of putting it back up there. I’ve got fabric piled on top of boxes full of fabric. With an unfinished quilt back stacked with the corresponding quilt top on top of all that. I’ve got in-progress summer stitching and hexagons in a ziploc baggie. A yoga mat and towel and toiletries not in the gym bag, where you’d expect, but on the floor next to the bag. My garmin and ipod are still plugged in their chargers from Sunday, thinking this was the week I’d start easing back into running. Has anyone seen my running motivation? I thought I caught a glimpse of her earlier this week. Its the post-vacation-inlaws-still-in-town chaos that’s manifested itself within this corner of the house. And I’d like it gone. 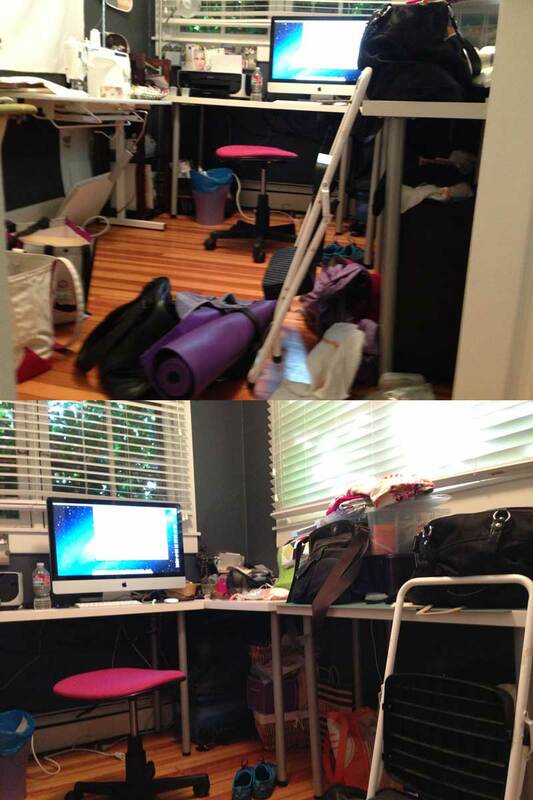 Not because my room is messy – I can deal with the mess. Besides its been too hot to actually work in that room lately. I’d like to not feel crazed and chaotic and out of control. So I’m letting go. I need to let go. Let go of routine and order and wondering if my kid has eaten anything else today besides Funyuns. What’s wrong with Funyuns?! You are helping him become well rounded and develop a discerning palate!! I’m with you on the trying to let go thing. Sometimes it’s not perfect, but it’s good enough.